*Phew* Merry Boxing Day ~ what a season it’s been!!! Apologies for the slow down in posts, just been trying to catch up with my life a little after the gift guides, giveaways, and more the last month or so! As a result you’ll be seeing a few more playful posts from my everyday life (like the ZOO posts!) I just spent most of today hanging out at the new house/NOTCOT HQ which is nearly ready, and luckily ready enough for me to move my first conference/dining/pool table into!!! I somehow ended up hanging out there from about 10am till 9pm… delivery didn’t happen until closer to 3pm, but luckily Dan was there to keep me company! And then we naturally had to play a few games both before and after grabbing dinner with a friend! And now i couldn’t resist sharing some pics with you! 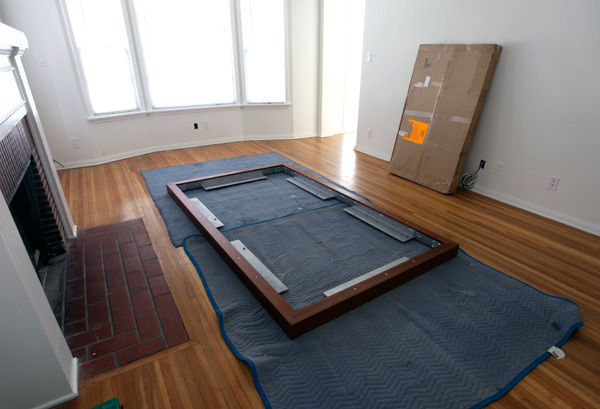 But first, these are overview/snapshots of the building of the table, because once i got home i realized that in the excitement of PLAYING, we forgot to take more pics… so more pictures of the awesome design details to come. So, remember Fusion Tables by Aramith? Wayyyy back as .org post #8996 that Laura Sweet posted? 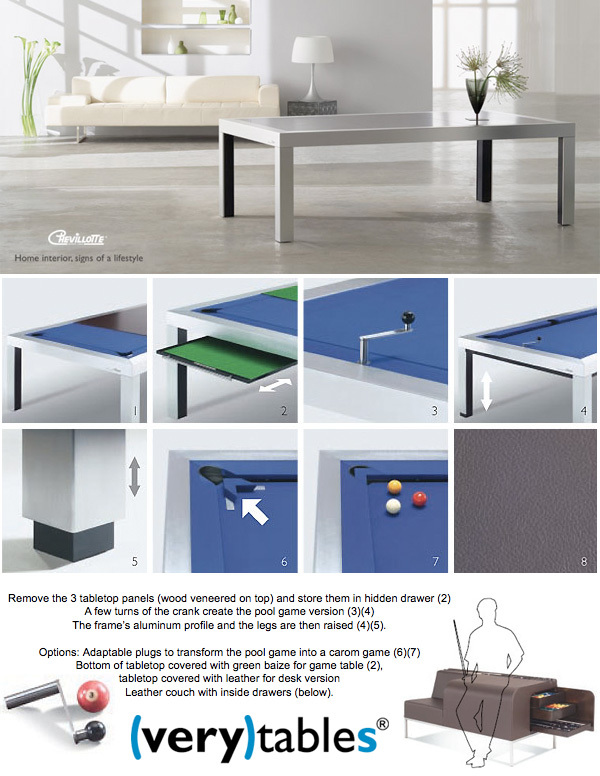 Basically its one of the first unique designs for pool tables that leans super sleek minimalist modern, and quickly hides in plain site as a dining table or conference table. To achieve this, Aramith (Belgian maker of incredible pool balls… “Without being familiar with the industry, very few would guess that nearly 80% of the billiard balls used worldwide come from a small village in the countryside of Belgium. 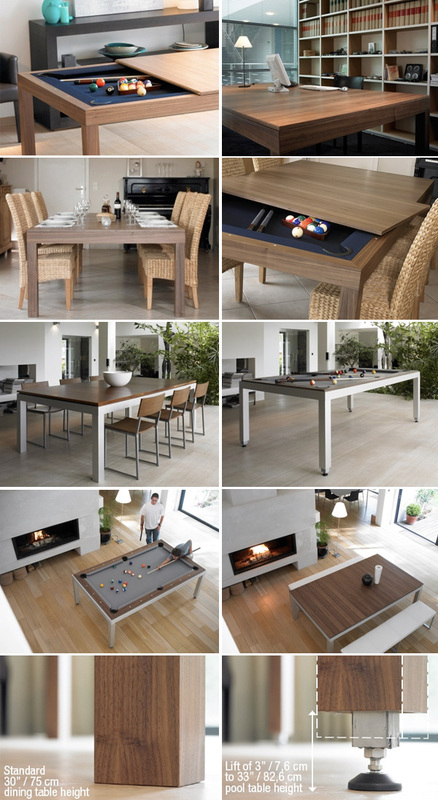 For over half a century, the company SALUC SA has produced in the secrecy of its premises in Callenelle the unique and well-known Aramith phenolic balls, making this miniscule village the world’s capital of billiard ball production.” from their history), has designed the Fusion Tables, with a special lift system to adjust the table from dining height to pool table height easily, spandex pockets solve the problem of needing pockets that show when viewing the table from the side, and it still has a single slate, and incredibly high quality felting! 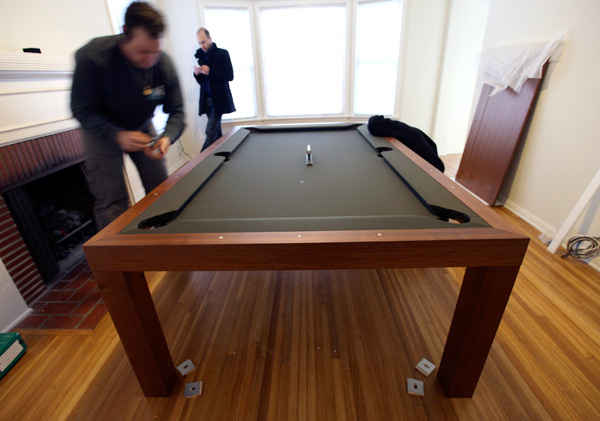 Really with the table top on, you’d never guess there was a pool table hidden within! 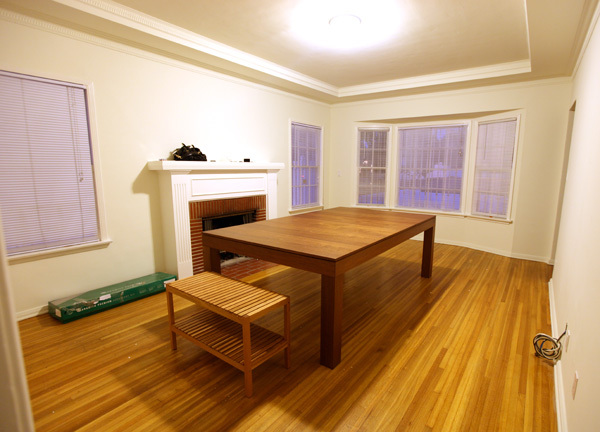 Anyhow, with the new house/office nearly ready, and the need for a dining/conference table ~ i couldn’t resist once i saw one in person! So take a peek at the set up of the table on the next page… and more pics to come! Here are the snap shots from today’s set up! I got the Walnut Wooden model with Olive felt ~ love the wood line more than the metal because it is completely flushed to the edges and i love the way the felt wraps behind the pockets… Only thing driving me slightly crazy is the slightest imperfection on the corners… maybe i’ll get over it, maybe i’ll rope dan into taking it all apart and poking at it with me… the thing only needs an allen wrench to dis/assemble. It looks pretty lonely right now as the only thing i’ve moved into the house! 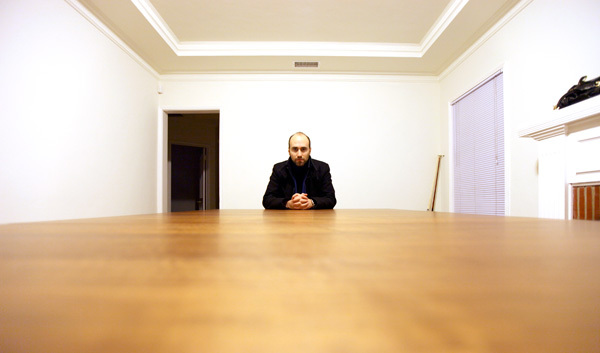 Thinking maybe this room will turn into a brainstorming-art/gallery-meeting room! We had lucked out that DK Billiards in Orange, CA is one of the only distributors, so we had a chance to go visit them ~ and seeing the Fusion Table in person really sold me ~ and nice to support a really sweet couple (with two adorable kids you’ll meet when if you go by the store!) running the place themselves ~ David Kay (of the DK) came himself to set up the table! Ok, well that’s the end of the first look ~ i got far too distracted between playing and the cold to take more close ups, but will definitely show you some of the details more closely soon! 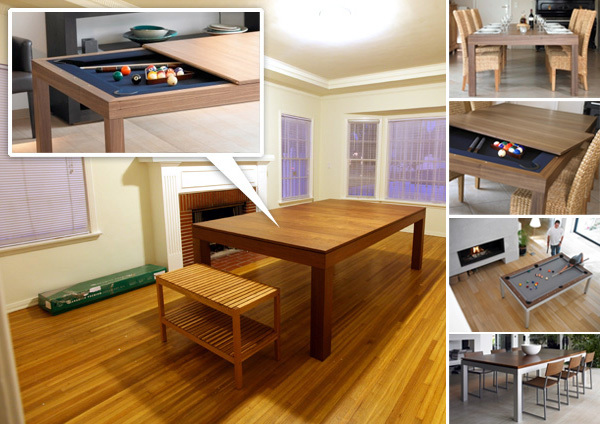 Personally ~ from the pockets to the full design, i’m still more smitten by the Fusion Tables!!! Hello Jean, I thought you might like to know that the Fusion Table will be available again soon in the all wooden version. Best wishes, David. 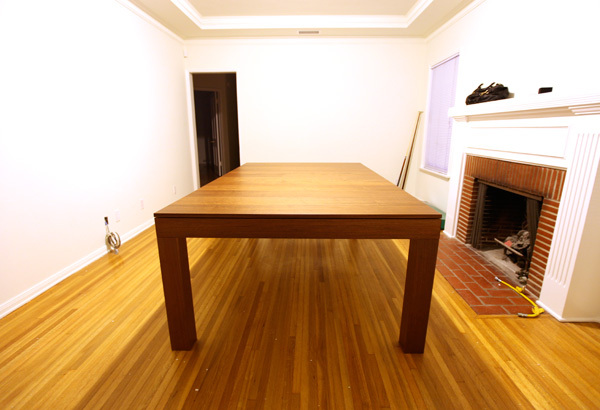 How are you enjoying the table after a few years? I am looking into one of these myself. We are very seriously considering buying a fusion table and loved your post about it. 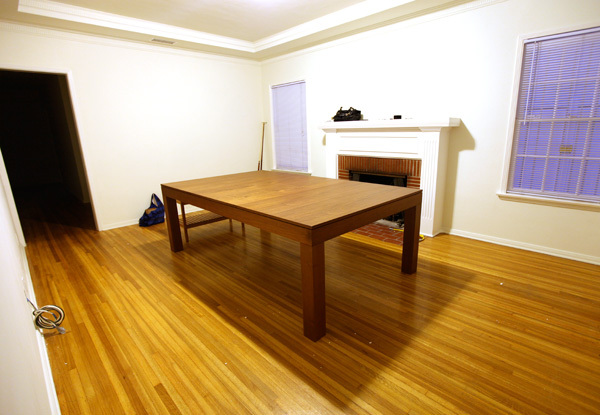 Can you give us an update on what you think of the table almost a year later? My husband is a bit disappointed that it is not the smallest regulation size (3.5 ft by 7 ft). 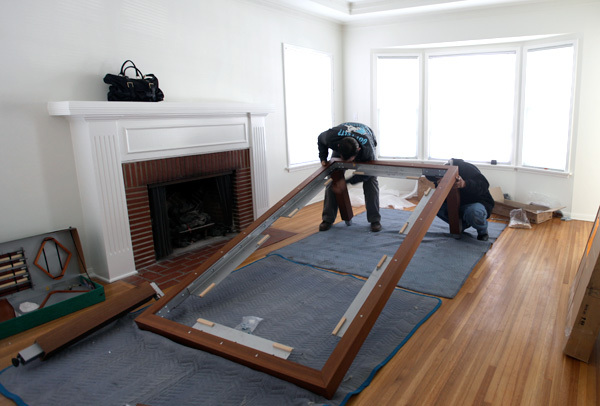 Have you found any issues going from your fusion table to the pool hall? Hello Jean & Daniel I hope you guys have had lots of fun playing pool on the fusion table. 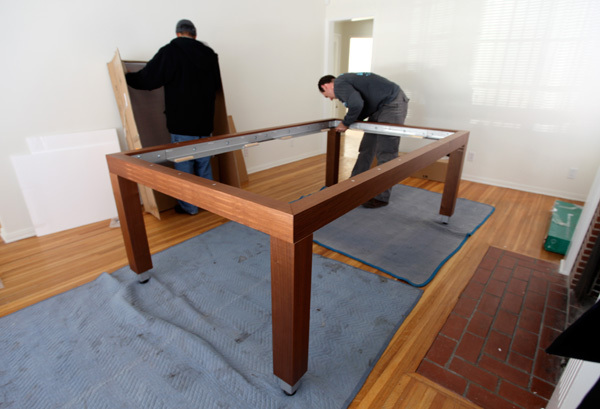 Thanks again for being one of our first clients and purchasing a Fusion Table from from Rory & I. That is the coolest thing I have ever seen. I want one!